While other video chat apps may be more popular, we've found that Google+ Hangouts brings the best experience to video chat, with a ton of extra features and the low price of free. What works best for you may vary. Depending on your connection and location, and the same of those you're chatting with, certain apps may work better than others. Plus, you'll often be a little dependent on what your video chat partner is using. But, if you have a choice in the matter, this is what we recommend. 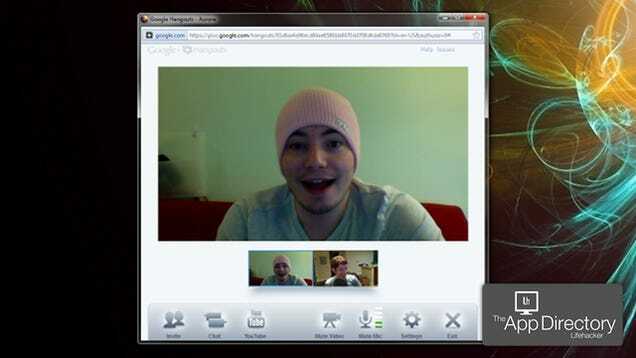 Note that Google Hangouts requires a Google+ account to use. Google Hangouts raises the bar for video chat. Most chat programs are fairly simple, two- or multi-way video chats. Some include screen sharing, and some more obscure clients may offer collaboration, but Hangouts adds a number of different features—like Google Docs collaboration, simultaneous YouTube watching, and the ability to focus on the currently talking individual—in a way that's really easy to use. The video and call quality is also quite good, and the idea of "hangouts" is definitely unique and makes video chat a more viable communication option to people who don't want to "plan" their chats. The only real downside to Hangouts is that it requires a Google+ account, which is a service not too many people are using (especially the people you might video chat with—like your grandparents). Choice of video chat client is, unfortunately, often governed by whatever the less tech-savvy partner is using, so you don't always have a choice. That said, if you have a choice, Hangouts is our favorite option—especially if you want to do a group chat. These days, most video chat applications are actually webapps that require small plugins to be installed, so few are Windows-only (which is great). Google Voice and Video—accessible from Gmail—is another great option. The quality is great with the enhanced video chat plugin, and it's built right into Gmail. Facebook Video Calling is surprisingly great. If you haven't used it, I highly suggest you try it. The quality is pretty fantastic, and practically everyone you know probably uses Facebook, so it's easy to get them to use that instead of something like Skype. (Note that Facebook's video calling is powered by Skype, but doesn't require its installation—all it requires is a plugin). You initiate a call from Facebook, but it opens up in its own little borderless window completely separate from your browser—in fact, you can even quit your browser and it'll keep running. It's dead simple to use, too, and has no clutter whatsoever—in the program's window or in your Start menu. Don't be scared by the Facebook branding, it's actually a really solid video chat client. Lastly, we have the ever-popular Skype. It's not our favorite—in fact, it's easily our least favorite of the above choices—but it's probably one you'll have to have on your computer anyway. We don't like it because its interface is big and cluttered, and it has a lot of annoying tendencies (like setting itself to autostart with your machine, and forcing you to use its jumplist to quit the program). You'll probably have to keep a copy of it around, but if you can, we recommend convincing your other parties to use Hangouts, or at least Facebook, instead of full-blown Skype. All that said, Skype isn't without its plusses—it is available on nearly every platform known to man (including mobile), and it does provide some pretty great phone calling features. But when it comes to video chat, you've got other, better options.